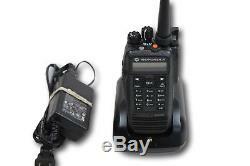 Motorola TRBO XPR6550 XPR 6550 VHF 136-174 Mhz 5W 1000 CH DIGITAL Radio. 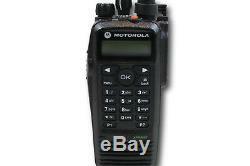 Motorola XPR6550 VHF TRBO radio, model number AAH55JDH9LA1AN. This is a DIGITAL & ANALOG 5 watt, 1000 channel radio with a band split of 136-174 Mhz. Radio is in great condition and guaranteed fully operational. 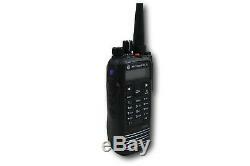 Radios are capable of both wide band and narrow band operation. This unit can be programmed for both analog and digital operation. Radios come complete with antenna, battery, belt clip and rapid charger. Free programming is available (1-16). 12.5/25 kHz Switchable Channel Spacing. Short free-form and quick text messaging. XPR 6550 includes integrated GPS module (requires MOTOTRBO Location Services Application). Site Roaming (IP Site Connect System). We will only program up to 16 channels and do not program for trunking systems. 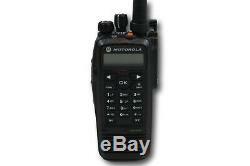 The item "Motorola TRBO XPR6550 XPR 6550 VHF 136-174 Mhz 5W 1000 CH DIGITAL Radio" is in sale since Thursday, July 19, 2018. This item is in the category "Business & Industrial\Facility Maintenance & Safety\Surveillance & Alarm Equipment\Two-Way Radios". The seller is "erac1" and is located in Lakewood, CO. This item can be shipped to United States, Canada.